The idea for the JoyKey came to me in the form of a question in January of 2009. …I HAD TO SHARE THE IDEA. My wife’s cousin, Stefan Kickum, gave me the idea and the contact for creating the WaterWick. Berd Schramm in Cologne did a BRILLIANT job of creating the prototype JoyKey casing, nailing it first go. Dieter Otto, Martin Ecker and Scott Bacon all embraced the idea immediately. 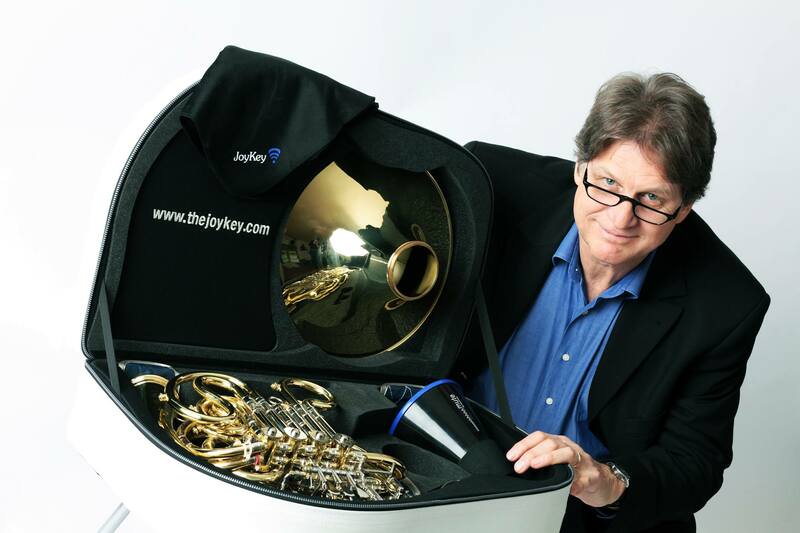 They were very supportive with getting the JoyKey into the heads and hands of brass/wind players AND onto their instruments …. … and in September of 2009 the JoyKey became commercially available. … imagine being able to literally drop the centuries old problems and the associated stress caused by water build up out of YOUR playing experience … automatically. The JoyKey automatic water drainage system is now the PROVEN, intelligent and ideal solution for effortlessly and effectively removing water automatically from brass instruments. Using the JoyKey system enhances your accuracy and productivity. Practicing and performing are far more rewarding, fun and enjoyable. The heart of the JoyKey is the high-tec WaterWick metal filter. It is both easily cleanable and replaceable. Condensation in brass/wind instruments gravitates to the lowest point possible. Here, the JoyKey allows the water to automatically and continuously drain out of the instrument … while maintaining the air seal. This ensures that the inner taper remains constant by completely eliminating water build up in the targeted tubing section. Most importantly, the WaterWick maintains the integrity of the air column of the instrument. Under playing conditions the JoyKey is completely air tight. I know because I have 14 JoyKeys on both of my Dieter Otto triples. Even playing loudly, low and stopped (the right hand closes off the bell) the air seal functions as needed. Replacement WaterWick packs are available from your local dealer or online from the JoyKey Shop. The JoyKey significantly REDUCES STRESS. If you are a professional brass/wind player, you’ll know that we are often judged solely by our accuracy levels. Higher accuracy levels also affords amateurs greater pleasure and satisfaction. The JoyKey noticeably reduces the stress and eliminates the potential for mistakes or even damage to the instrument caused by us having to quickly remove water from the instrument when emptying manually. The major benefit of the JoyKey system on all brass/wind instruments for the players is the predictability and reliability of pitching notes resulting from the interior lead pipe taper remaining constant and WaterFree. This lets you completely forget about the water and focus on your playing and the music.